It's raining heavily. I walked home from the groceries only to find a young man walking the same way in front of me. He had a silver shoe, a mid-long purple coat with a large belt tied around it. With a clear plastic umbrella and a pink bracelet, it was not difficult to figure out. I walked faster, in hurry to reach a dry comfort that is my house. Then, I realized, he was walking faster too. I could see his face angled a little to the left, his complexion as pale as pearl, hair like a bieber gone worse and he was peeping back at me. Suddenly, a car zoomed past leaving the both of us shocked. After recovering from the awkwardly high pitched squeak I thought impossible coming from a grown man, I walked even faster. Right there and then, it was obvious and I had to lay it out there. I'm not fricking following you! If you do that again, I'm going to follow you just to see if you cry. Anyway, we all love Goldfish crackers. These are in cute Gingerbread man shapes. Some happy, some less happy, some evil. 1. Pulse everything together (except water) until it forms a bread crumb texture. 2. Add water and pulse until it forms a ball. 3. Gather the ball of dough in plastic and refrigerate for 20-40 minutes. Preheat oven to 175C/350F. 4. Roll out into 1/4 inch thick and start cutting them up. 5. On a lined baking pan, lay the pieces out making sure not to touch each other. 6. Bake for 15-20 minutes each batch. Those little crackers look so sweet. My kids would love them! @ JoKnows: They're really a kid lover! OMG these are so cute!! I have never had gold fish crackers, and I almost bought a bad yesterday from Shoprite but since I wasn't sure how they taste I didn't buy it!! But this homemade version sounds so good!!! I would love to try them!! @ Catalina: You should get the bag! I'll be honest, still love those expensive bags of goldfish! but at times, this would do.. I've heard of goldfish crackers but we don't have them here sadly. Such a cute, funny post! I'd really like to give these a try but only have cookie cutters. I'll have to keep an eye out for some cute fish cutouts or something. @ Emma: I read a post about using a can to make your own cookie cutter! @ Ray: Thank you! :D I try cute once in a while, fail most of the time. 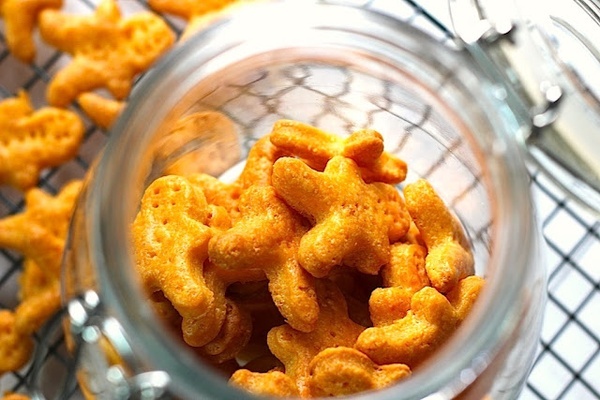 I've never heard of goldfish crackers but they look and sound delicious - cheese biscuits are the best! @ thelittleloaf: Cheese Biscuits ROCK!!! Ahhhh so cute! Where did you get this cookie cutter from? Stunning photos! @ MrsF: You're back! yay!! How cute! and Yummy too!! they are so awesome , i am sure everyone loves it.. especially kids... oh yummy! Cheesy crackers! Yum! I make similar ones but they don't look so cute! 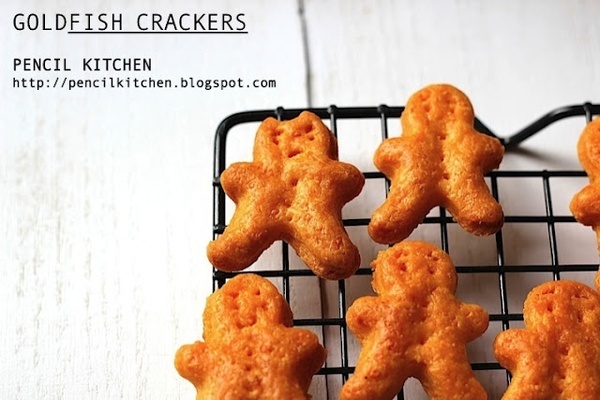 Cute fish/gingerman crackers. Can't remember when I last time had them. Love those photos...as adorable as the cookies. 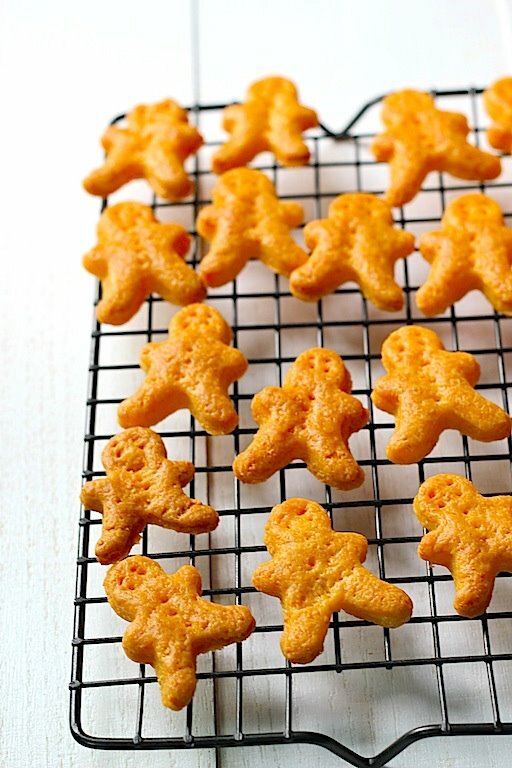 Oh these looks so yummy and I LOVE that you turned them into to cheese gingerbread men shapes! These are so cute, Jesica! If they taste as good as they look then they're winners to me! Wonderful, creative recipe. I have been wanting to make some for an eternity... Your fabulous (as usual) pictures really want me to make some really soon now... They look amazing. Love the shape!